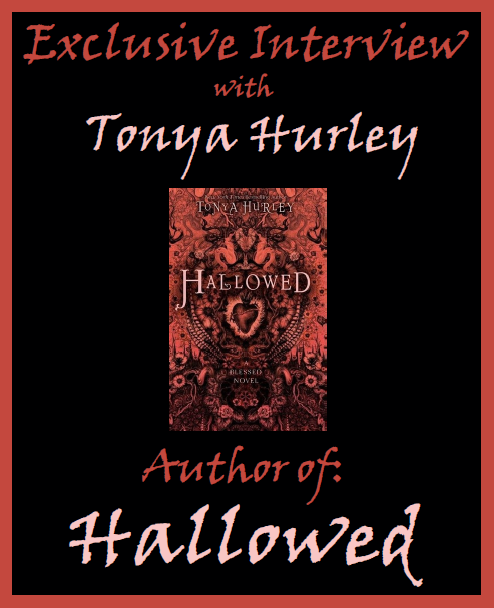 HALLOWED is the final novel in The Blessed trilogy, and we're honored to have Tonya Hurley join us to share more about it. Tonya, what was your inspiration for writing HALLOWED? The main inspiration for the entire Blessed trilogy happened while touring Mexico. I love visiting churches to see the art and relics wherever I go and I was blown away by all the iconography, not to mention lots of street art marries skulls and religious imagery. I went home and researched ancient female martyrs in the first and second centuries A.D. I was surprised to learn how young these girls were and how strong, brave and defiant. I'd always had this image of Saints as soft and passive but nothing could be further from the truth. They were badass and I found that the stories were full of supernatural elements and forbidden loves - perfect for YA. Also, I believe theses tales are the first YA stories we have, really. All the death scenes for the saints were super hard but I loved writing them the most. There is a death scene in Hallowed that was the hardest for me to write, but I don't want to give any spoilers. I also love writing Cecilia's music scenes - her life most parallels mine in that she's a struggling musician moving to NYC and trying to make it. Also, it was fun to write Lucy's parts - being a publicist when I first moved to NYC for some incredibly famous people gave me real insight into the world of fame and the pressure and loneliness that comes with it. I like to say these books are a mix of Gossip Girl and Carrie if written by Quentin Tarantino. A little horror, a little fantasy, a little action, a little romance. How long did you work on HALLOWED? Of the three Blessed books, Precious Blood, Passionaries and Hallowed, Hallowed took the longest to write. I spent about 18 months on it. The message the girls are trying to convey in these novels is: know yourself, accept yourself and be yourself. I think it's never too late in life to learn that and I finally did. I think. 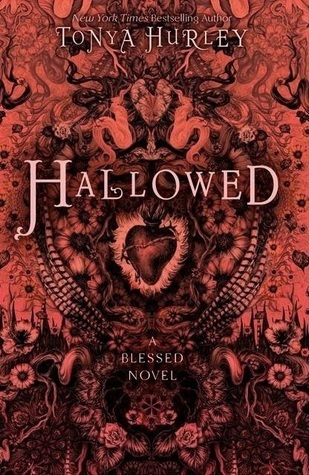 What do you hope readers will take away from HALLOWED? I hope they are moved and entertained by it. The books are at times dark, shocking, violent and gritty but I hope readers are able to see the heart and sense of humor in the story and the characters too. Also, these books are incredibly empowering in my opinion. My road to publishing wasn't your standard one. ghostgirl, my first series, began as a film script, so fleshing that out into a full-fledged novel was a real challenge, but thankfully the team at Little, Brown saw that it would make a good book. Likewise, my editor at Simon & Schuster had the vision to publish The Blessed trilogy which was really brave of them, especially in the YA space. Books about ancient female martyrs dying brutal deaths in modern day Brooklyn were not exactly trending when I started writing them. A humorous story when I first published ghostgirl - my editor at LBYR Nancy Conescu called me and told me I had received a starred review from Publisher's Weekly. I acted happy, because she was, but I hung up the phone feeling disappointed. She called me throughout the week telling me that I'd also received starred reviews from Kirkus, Voya and School Library Journal. She was thrilled and I was deflated. I thought that ONE star was a bad thing, but apparently that isn't the case in publishing. I was so naive. Not for me, it's different for me with every book which makes it both exhilarating and terrifying at the same time. Music and coffee and a black cat are important parts in my writing ritual. I have an attic office in my home, which is a 19th Century Victorian farmhouse, where I prefer to write. Lots of vibe there as you would imagine. I also like to mix it up and write in coffee shops, in the thick of it with other writers. It's motivating. A novel-length fairytale that I have wanted to write for several years now. Very different than anything I've written before. 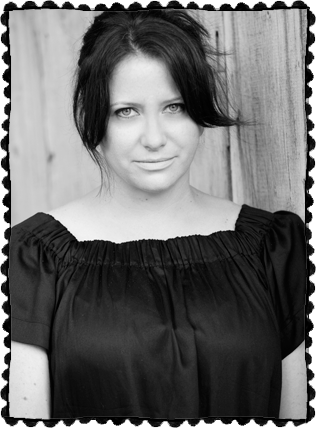 Tonya Hurley is a New York Times and international bestselling author of the ghostgirl series (Little, Brown) and The Blessed trilogy (Simon & Schuster). Her books are published in nearly 30 countries and in more than 20 languages. Ms. Hurley has a worked in virtually every aspect of teen entertainment: creating, writing, and producing two hit TV series; writing and directing several acclaimed independent films, music videos and videogames. She is a contributor to the Huffington Post, an active member of the Writer's Guild of America, a member of the Horror Writers Association Her first novel, ghostgirl was an instant bestseller and received starred reviews from the literary publications Publishers Weekly, Kirkus, VOYA and School Library Journal. The ghostgirl audiobooks are narrated by Parker Posey with original music by Vince Clarke. PRECIOUS BLOOD, the first book in her new, gritty young adult THE BLESSED Trilogy was released September 25, 2012. PASSIONARIES, the second book, was released January 7, 2014. The Blessed audiobook is read by Moonrise Kingdom star Kara Hayward. 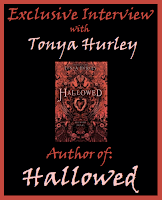 What did you think of our interview with Tonya Hurlery, author of HALLOWED? Let us know in the comments!